Features: Enviably perched atop Tahoe’s Donner Summit, Sugar Bowl is the closest major resort to Sacramento and the Bay Area. Spanning four peaks, serviced by 13 lifts and 1500 acres with 500 inches of snowfall annually, Sugar Bowl offers terrain to accommodate beginners and challenge experts. Sugar Bowl celebrated 70 years on Donner Summit in 2009/2010 and has kept its classic ski atmosphere while providing modern amenities. Guests can access the resort through two portals: a quick ride on the historic gondola to the snow-bound Village or slope-side parking at the modern Mt Judah Day Lodge. Why We Go:  Sugar Bowl Ski Resort offers the best alpine skiing in Tahoe. With a renowned legacy, Sugar Bowl Resort has been catering to skiers and boarders for over 70 years. Advanced Terrain: Come ski Sugar Bowl where over a third of the mountain is devoted to advanced terrain and is intermediate-level runs comprising a total of over 80% of the mountain. CORE Program: The CORE Program at Sugar Bowl Resort is for season pass holders. It allows you to skip lift lines and earn rewards points redeemable all over Sugar Bowl. Save money and get the most out of the Sugar Bowl Ski Resort with the CORE Program. 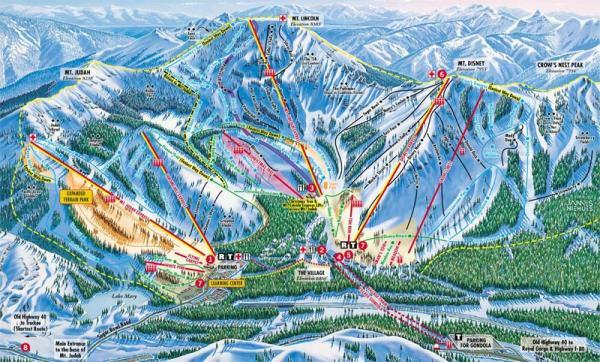 Closest: Sugar Bowl Resort prides itself on its accessibility. It remains the closest ski resort to the San Francisco Bay area making it an easy stop for skiers from all over California. Inside Knowledge: There is a new Daily CORE Pass available for skiers who do not shred as often as necessary to make up for the annual pass prices. The Daily CORE Pass gives you all the same benefits of the CORE Program, except you purchase a new day pass on each visit; however, you receive $15 off your lift ticket with the Daily CORE Pass Program. Do Bring Your Kids: The Sugar Bowl Resort is perfect for kids whether they know how to ski or not. There are multiple lessons and programs for young skiers and snowboarders that are both affordable and fun. Do Check Out The Lodge: The Lodge at Sugar Bowl is the perfect place to stay on your ski trip. Enjoy the ease of walking out of your room and onto the slopes. They also offer tremendous Sugar Bowl Packages, so take a look on their site for current promotions. Don't Wait In Long Lines: The lift lines at Sugar Bowl Ski Resort are fairly short, so you don't end up spending half your day standing in the snow. Also, if you happen to purchase some kind of pass from the CORE Program, you're able to skip the general lines and go straight to the lift. Don't Forget The CORE: Ski Sugar Bowl with the CORE Program and receive rewards points for all the hard work you put into shredding. In 1938, Walt Disney envisioned the Sugar Bowl Resort, and put up the first chair lift in California. Sugar Bowl Ski Resort remains one of the longest running ski resorts on the west coast. During the summer, Sugar Bowl Resort is the perfect venue for special events and weddings. Mountain Sports Learning Center: Whether you are a beginner or an absolute expert, the Mountain Sports Learning Center is the perfect place for all of your instructional needs. Mike Iman and his team of instructors will make learning to ski or ride easy, fun and hassle free. Coupled with general admission (GA) offering FREE rentals and lessons for qualified ticket holders (ages 13-69) or season pass holders four and up on GA days, you will be on learning fast track. The "Den" children's learning center: The Den is the designated home to Sugar Bowl’s Signature childern's programs: Sugar Bears, Powder Cubs and Black Bear Adventures. Each class offers a 3:1 student-to-instructor ratio. The Den is complete with personal cubbies, games, videos, rest areas, a hot meal kitchen and a team of awesome instructors. The resort offers two retail locations to outfit you from head to toe for the perfect skiing or snowboarding experience. Visit Mt Judah Ski and Sports for accessories, outerwear, snowboards, boots and bindings. Chalet Ski and Sports offers a wide selection of outerwear, as well as skis for sale and demo. The Chalet is also home to Best Fit Boots, specializing in custom-fitted ski boots for everyone, from the recreational skier to the elite athlete. Rental facilities are located at both the Mt Judah Day Lodge as well as at the base of Mt Disney in the Village Rentals building. Both shops have an extensive selection of Volkl and Burton products. Basic packages of skis/boots/poles and boards/boots, as well as performance skis, are available. Sugar Bowl Resort Lake Tahoe offers ideal lodging for the vacationer who wants to be as close to the skiing as possible. You're actually on the mountainside by the skiing fun. You'll be in one of 27 hotel rooms that comes equipped with amenities to keep you feeling comfortable while you're away from home. Sugar Bowl Lodging transports you to the resort by gondola, the only way to get to your accommodations.